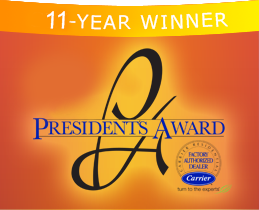 Sunshine Air Conditioning, Inc. is extremely proud to have been singled out with the Carrier President's Award, which recognizes factory endorsed dealers who serve as role models, and are held up to others as an example of leadership, integrity, and performance. Striving to provide personal follow-up, and prompt, knowledgeable solutions to your comfort problems has earned Sunshine Air Conditioning, Inc. this highest level award an astounding 11-years in a row. From 24/7 emergency service to Wells Fargo Financing with approved credit, we are always working to offer superior convenience and facilitate your project. Our team of professionals are NATE-certified, licensed electricians, who ensure accurate and cost-effective completion of every job. And for further peace of mind, all of our services are covered by our 100% satisfaction guarantee. At Sunshine Air Conditioning, Inc., our customers are our number one priority. By providing the most skilled, economical, and reliable service throughout The Villages, FL; Summerfield, FL; Silver Springs Shores, FL; Wildwood, FL; Leesburg, FL; Lady Lake, FL; Belleview, FL; Ocala FL, we take better care of your comfort. Over the last twenty-five years, we’ve continued a tradition of excellence that is evident from our A+ rating by the Better Business Bureau. We have been recognized with the Angie’s List Super Service Award for five years as well as the Carrier Presidential award for the past 11 years. Our growing success is built on a foundation of honesty, courtesy, and ethics that never wavers. Sunshine Air Conditioning, Inc. is distinguished as a Carrier Factory Authorized Dealer. To qualify for factory endorsement, we continue to meet rigorous national standards and sound business practices, such as maintaining required local licenses, appropriate liability coverage, and fulfilling warranty obligations in a timely manner. We participate in extensive factory training, specific to Carrier products and the technical aspects of equipment installation, maintenance, and repair. 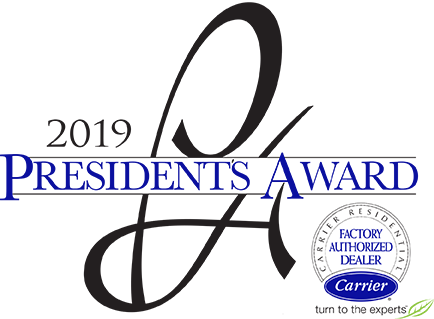 Through innovations in technology and design, Carrier continues to set the standard for heating and cooling worldwide. One hundred and ten years of improvements have led to the most intelligent systems on the market today. With Infinity heating and cooling, you can tailor temperature, humidity, air quality, fan speed, ventilation, and more, from a single, simple-to-use device. When an Infinity Touch Control is installed as part of a complete Infinity System, the system will recognize changing outdoor and indoor conditions and adapt to provide peak performance and efficiency. The Control knows to conserve energy when you’re away from home and will make sure you come home to ideal temperatures. The Infinity Control customizes zoning capabilities, remembering precisely how each member of your family prefers their space conditioned. It will alert you to the need for filter changes and service, and offers an energy tracking feature, allowing you to view usage from the control, or (with the WiFi-enabled unit) from your computer, tablet device or smartphone. Keeping cool in Belleview can be tough, so trust your AC repair & service to the expert technicians at Sunshine Air Conditioning, Inc.. Our certified technicians specialize in air conditioning repair, service, and installation of all makes and models. 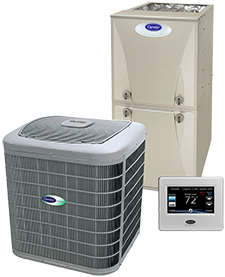 We are also a Carrier Factory Authorized dealer, so if you’re looking for a quality and efficient AC system to install at your home or business, we can handle that for you! Don’t let your family get stuck suffering in the heat. Make sure your air conditioner is serviced yearly so it runs optimally, it’ll help keep your energy costs down and it will also reduce unnecessary wear and tear on your air conditioning unit. To learn more about Sunshine Air Conditioning, Inc.‘s expert air conditioning services, give us a call today. We happily service Marion County, Sumter County, and Lake County, FL. Interested in a Maintenance Plan? To protect your heating and cooling systems from wear and tear, dirt buildup, decreased efficiency, and shortened service life, Sunshine Air Conditioning, Inc. offers professional maintenance service. Cleaning, inspection, and troubleshooting keeps your equipment in tip-top condition, eliminating most repairs and promoting healthier air quality. 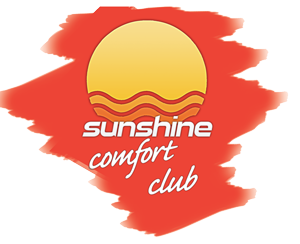 For added convenience, savings, and peace of mind, Sunshine Air Conditioning, Inc. offers membership in our Comfort Club. No diagnostic fee – Members never need to pay the diagnostic fee for any mechanical failures you may experience. No overtime charges – Whether you need us for emergency service during regular business hours, on a holiday, or on a weekend, we’re available to our members for no overtime charge. Discounts – Our members receive a discount on labor and repairs. Priority Service – No matter how busy we may be, your service needs take precedence in our scheduling process. Bonus Bucks – Every year that you are a Comfort Club Member, you’ll earn Bonus Bucks that can be put toward the purchase of a new comfort system. Satisfaction Guaranteed – You can cancel your Comfort Club Membership at any time, for any reason, and the unused portion of your dues will be refunded. Seasonal Maintenance – There is no additional charge for proactive service, which extends life of systems, eliminates the majority of repairs, ensures maximum efficiency, and protects safety and air quality. Call Sunshine Air Conditioning, Inc. at (352) 245-1139 to sign up!